John’s Horror Corner: The Hills Have Eyes Part II (1984), Wes Craven’s surprisingly tame cannibal cult classic sequel. MY CALL: For lessons in horror film history, this film is a deserving classic. But for raw entertainment value, I’d instead turn you to the brutal remake and its sequel. MOVIES LIKE The Hills Have Eyes Part II: I’d stay really close to home if you liked this movie. You could start with the original The Hills Have Eyes (1977), another classic which today feels overly tame. Then go with movies like Just Before Dawn (1981), The Hills Have Eyes (2006), The Hills Have Eyes 2 (2007), the Wrong Turn franchise (2003-2014) and The Texas Chainsaw Massacre franchise (1974-2000s). I love that this opens with the disclaimer that this film is based on “fact,” followed by an amusingly dramatic narration reviewing the disturbing events of the 1977 original. We even enjoy the credits with the same style of silhouetted southwestern desert mountains and disturbing sounds to create unease, and stock footage with the previous film’s highlights recounted in therapy sessions as Bobby (Robert Houston; The Hills Have Eyes) works through his survivors’ guilt. But it seems that Bobby is only here to remind us of part 1. It turns out Bobby has developed some sort of fuel being tested by a motorcycle racing team. Everything should be fine, right? But on their way to the races, much as Bobby’s family did in 1977 (and so many twentysomethings in the Wrong Turn franchise), they take a short cut through an old bomb testing range and run out of gas in the desert wilderness… right where Bobby’s family ended up years earlier. Among the racers are Hulk (John Laughlin; The Lawnmower Man, Space Rage), Foster (Willard E. Pugh; RoboCop 2, Puppet Master 5), Harry (Peter Frechette; The Kindred, The Unholy), Roy (Kevin Spirtas; Friday the 13th Part VII, Subspecies II-III) and his blind girlfriend with psychic senses, and Jane (Colleen Riley; Deadly Blessing), along with Beast (the German shepherd from the first movie) and a reformed Ruby [who now goes by Rachel] (Janus Blythe; The Incredible Melting Man, Drive In Massacre, Eaten Alive, The Hills Have Eyes). But no one knows of Ruby’s history with the cannibals, including Pluto (Michael Berryman; Weird Science, The Hills Have Eyes, Deadly Blessing)—who also survived at the end of the first movie. After encountering Pluto, Ruby/Rachel informs the gang of her and Bobby’s history. 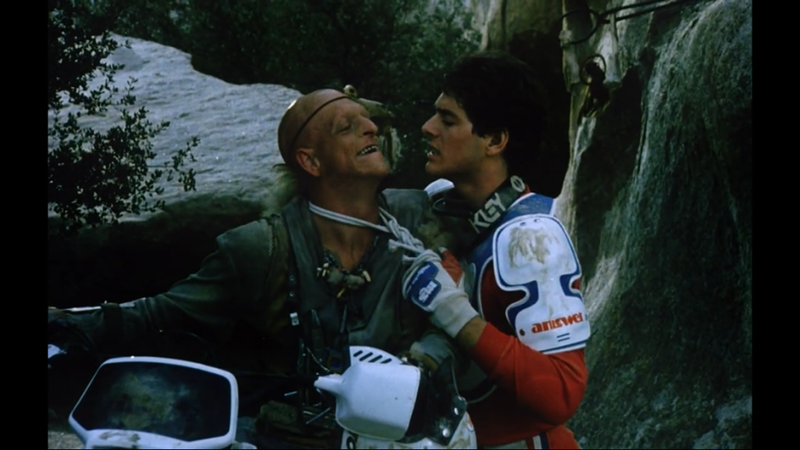 Clearly not appropriately phased by her story, the guys decide to do some dirt biking reconnaissance and end up chasing Pluto and meeting Reaper (John Bloom; The Dark, The Incredible 2-Headed Transplant), the last two survivors of the desert cannibal clan. Like its 1977 predecessor, the action and violence probably won’t entertain today’s fans very much. This often feels as much like a watered-down Mad Max as it does horror. Despite all the chases, booby-traps and scuffles with cannibals, this really isn’t very exciting. The death scenes are really weak. A rock falls on someone and we don’t see anything happen, another falls off a cliff (off-screen impact and no body shown), a guy gets speared in the chest in about as lame a manner as possible, a girl is crushed to death by a bear hug (but you wouldn’t know it were it not for the obvious sound effects), and then there was one hardly redeeming on-screen throat slit. Being rather hokey (like part 1), this film just doesn’t feel like it was made by a mature filmmaker. It’s hard to believe that Wes Craven (The Hills Have Eyes, Scream, Cursed, Deadly Friend, Deadly Blessing) did this and A Nightmare on Elm Street (1984) in the same year, with the latter so inspired compared to the former. It’s interesting how the “seemingly” abandoned cannibal lair is approached by our protagonists much as the apparently empty house in The Texas Chainsaw Massacre (1974)—which also featured a culturally displaced and disfigured family of cannibals butchering twentysomethings—yet The Texas Chainsaw Massacre 2 (1986) seems to have borrowed and vastly improved the underground lair and its macabre accoutrements found in this film. This chain of borrowing butcher’s blocks festooned with human parts and disgusting subterranean lairs would additionally be followed by Wrong Turn (2003) and House of 1000 Corpses (2003) among others, but as far as I can tell, we owe the disfigured cannibal family motif to Wes Craven’s 1977 classic. Unlike the original, this sequel ends with a stronger sense of finality in ending the threat of the cannibal family as our survivors and Beast walk away. Sadly, that might be the only redeeming quality of this film. However, much as other classics that feel so much “slower” and “tamer” today (e.g., Suspiria, Halloween), this film’s impact on the genre remains undeniable.